A leading publisher of Genre Fiction Pro Se Productions announces that author Alexander Brown’s best known work, already available in print from Pro Se, is now available in digital format as well. Prepare to be disturbed to the edge of your seat by Traumatized: Special Edition. Author Alexander S. Brown explores the darkest recesses of the heart and soul to bring readers to the edge of the abyss, ready to see themselves in the hole below. Traumatized: Special Edition from Pro Se Productions exposes the depths of human depravity and the dank realms of the macabre. Learn of a depraved congregation beyond the comforts of church. Journey the downward spiral that forces a morally corrupt celebrity to revile her ugliness. Experience the lengths to which a madman will go to keep his true love. Join Brown as he explores the world of maniacs, the supernatural, creatures, eternal damnation, and the occult. Divided into five chilling sections, Traumatized features the atmospheric and evocative artwork of artist Robert K. Read and realize that bump in the night isn’t just a tree branch tapping at your window. Learn what it really means to be Traumatized. 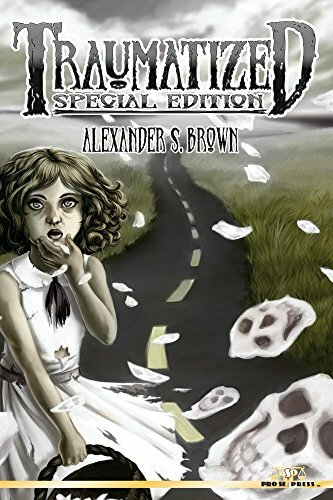 Traumatized: Special Edition features an incredibly haunting cover by Kathryn Frizzell with logo design by Percival Constantine and ebook formatting by Russ Anderson. The digital remastered edition of this collection is available at Amazon for the Kindle at http://tinyurl.com/lmvdak5 and in most other available formats at www.smashwords.com for $2.99.